I fou nd out about this proposed project when I was walking in the park’s arboretum looking at the diverse plant life on this planet, when I was handed a flyer by a woman asking me if I wanted to “Save Golden Gate Park“. I thought that Captain Kirk and I already had as part of saving the planet back in 1986, but when I inquired further it turns out that the people in this decade seem to keep forgetting the message to protect life in all its forms; from tiny shrimp to huge whales, because you don’t know how those actions will impact the future. It’s better to safe than sorry. On Vulcan we call that the precautionary principle. This principle seems to have caught on in Earth’s European countries, but in the US (and in China) the decision making process is more like, “Prove to me that your ‘future harm’ is worse than our current need, or we move forward.” Here’s a video about one child who looked at the future harm of the project to ocean life. Smart kid, probably part Vulcan. I found out the history of the project. It sprang from a Clean and Safe Neighborhood Parks Bond in 2008 which was combined with one of those “public private” partnerships that the right is always pushing. I know that those partnerships are touted as a way to save taxpayers’ money, but too often they come with strings the size of oil pipelines. In this case it was the City Fields Foundation (whose money comes from the Fisher family via The Gap) who were offering to put up the money for artificial turf so the city could use the bond money to fix and build restrooms, restore hiking trails, plant trees and make sure park buildings don’t fall down when the next earthquake hits. That was super nice of them, but what the city didn’t do was to really look at the problems with this artificial turf, the massive lighting and the location. I know you aren’t supposed to look a gift horse in the mouth, but what if that gift horse is really a Trojan horse that contains some nasty chemicals? And there are some serious nasty chemicals in tires. Chopping them up into little bits doesn’t make them safe, what it does is make the REGULATIONS stop applying to them. If Material in Shape of a Tire = Toxic Then Same Material in the Shape of a Pea = Non-Toxic, is scientifically illogical– but just good marketing if you want to avoid regulations when getting rid of something toxic. “We are just thinking about the children! Don’t you want them to play? What kind of monsters are you? And besides, this is a free ride, no-new taxes! What are you, an idiot who doesn’t want to turn your parks into money generating locations? We must work with or sell our assets to private entities, and then we must do what these entities say. We have no leverage since they are the ones with all the money.” And that is what happened in SF. Interestingly, almost the exact same thing happened in New York City, with Bloomberg’s foundation as the entity putting up the money for artificial turf. Patrick Arden did a brilliant award-winning series about the installation. Eventually New York put a moratorium on new artificial turf installations. He covers everything from how the testing of the artificial turf was gamed to avoid having to remove it to how New York Parks and Rec hid its maintenance numbers because it inflated the cost to maintain natural turf and lied about the cost to maintain artificial turf. In New York they minimized the dangers of the artificial turf by cherry picking the literature (which wasn’t complete in the first place) and then “balancing” it against obesity. They knew that you can easily see fat kids right now, it’s hard to see kids with cancer or lead poisoning five years from now. They throw up false comparisons that more kids will get diabetes and other weight related ailments if they don’t install the artificial turf with shredded toxic tire in-fill. They don’t look at artificial turf without toxic tire in-fill or good ol’ natural grass. 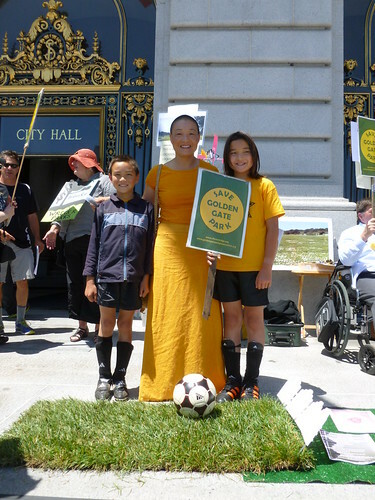 In San Francisco the campaign from the soccer people didn’t revolve around childhood obesity, but around FUN, “playability” in the rain and avoiding gopher holes in the poorly maintained natural grass fields. They paraded adorable children in adorable soccer outfits in front of the planning department saying, “We like artificial turf better because there are no gopher holes.” It occurred to me that none of these kid had ever played on a well-maintained grass field. These kids didn’t love artificial turf –they hated gophers holes. So know you see how the Greenest City in the US got into the position of paving over paradise for fun and profit. Now I’ve given you an action to take (contact info for Mayor and Supervisors) but I also wanted you to know about solutions. 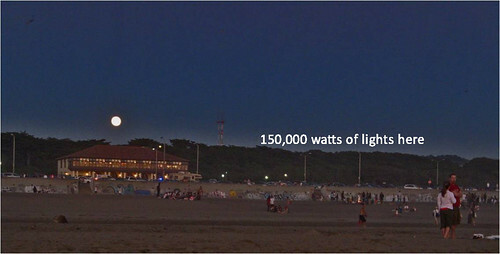 There is a proposal put forth by the group SF Ocean Edge called the Win-Win Solution. 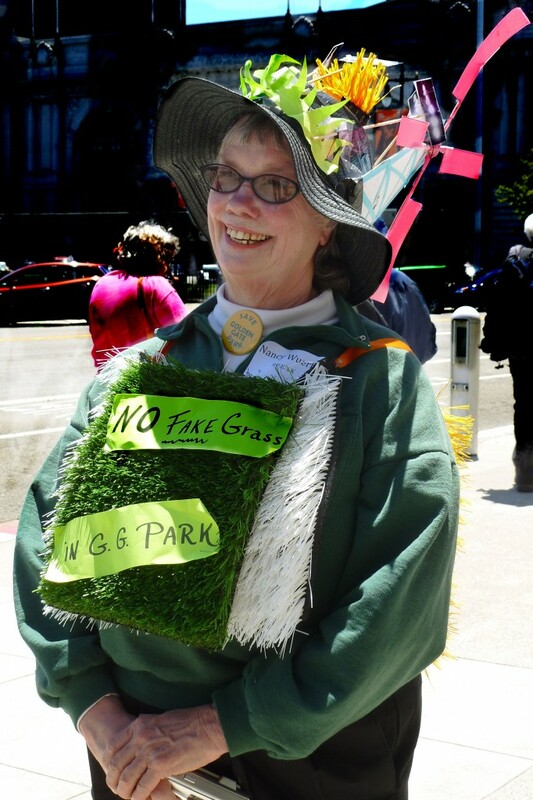 This alternative calls for renovating the Golden Gate Park natural grass soccer field and no lighting and restoring West Sunset Playground – only 8 blocks to the south — with artificial turf that is made of a safe materials and with appropriate night lighting. I like this solution because, like my Captain, I don’t believe in no-win situations. I think it will make everyone live long and prosper- except gophers.